For years, automotive journalists have suspected the cars in automakers' test fleets are somehow better-finished than those customers get. (We've already told you how Ferrari games that system.) Now, Consumer Reports has some questions for Volkswagen about its 2012 Passat press cars. What was it that set off CR's neck bristles? 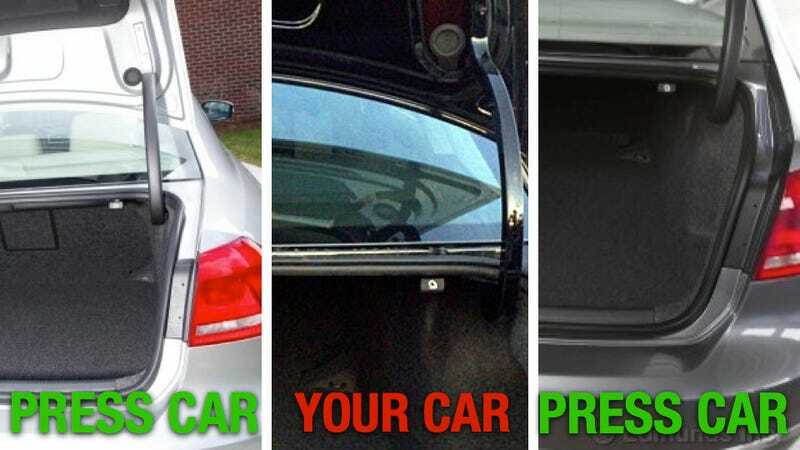 Apparently, the very detail-oriented CR analyst Jon Linkov noticed a press-fleet Passat had two plastic covers dressing up each of the car's cheap-looking trunk hinges. For confirmation, Linkov checked out trunk photos of press-loaner Passats from Car & Driver and Edmunds, and indeed, each showed plastic covers over both hinges. Aha! But the Passat TDI that Consumer Reports purchased from a dealership for its own testing purposes has but one plastic cover — only to obscure the wiring loom that runs down the driver's side hinge. The other hinge? Bare metal! Ye gods! What trouble hath arisen amongst us? Linkov explains why this is a big deal. In this case it's a matter of smoke-and-fire. But considering Consumer Reports has access to both press cars and customer cars, we'll just go ahead and assume they'll be on this beat full-time from now on. Now, if only they tested Ferraris.